Calendar of Treasury Books, Volume 9, 1689-1692. Originally published by His Majesty's Stationery Office, London, 1931. Money warrant for 12l. to Samuel Finney, esq., Receiver General of the First Six Months' Aid for co. Chester ; for his extraordinary charges in paying in his moneys. (Money order dated May 13 hereon.) Money Book XI, p. 53. Order Book III, p. 167. William Jephson to the Auditor of the Receipt to issue to the Earl of Portland for the Privy Purse the 7,000l. directed to be reserved the 4th inst., supra, p. 1134. Disposition Book IX, p. 125. Same to same to issue to the churchwardens of St. John Baptist, Walbrook, 7l. 13s. 4d. out of the moneys of the fourth part of the Customs now reserved in the Exchequer. Ibid. Same to same to issue to me [Jephson] for secret service 63l. 17s. 6d. out of the moneys of the small branches of the revenue in the Exchequer. Ibid. Same to Mr. [Charles] Fox to report on the enclosed petition [missing] of the tradesmen who clothed the Regiment late under the Duke of Norfolk and Earl of Lichfield, praying payment of 1,008l. 12s. 8d. due to them on that account. Out Letters (General) XIII, p. 59. 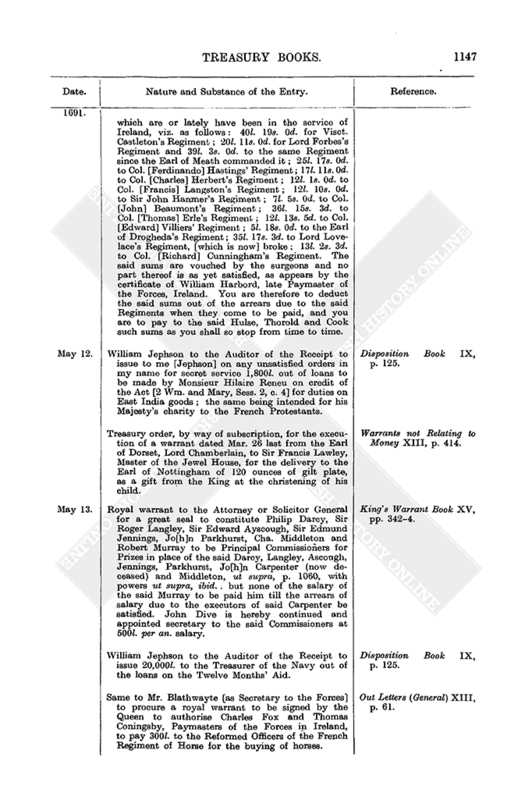 Same to same to report on the enclosed petition [missing] of the executors of Sir Edward Deering concerning a tally given to them for payment of the clothing of that Regiment. Ibid. Same to the Agents for Taxes, enclosing two papers [missing] from the [Assessment] Commissioners for [co.] Cardigan "about the difference between the Commissioners for putting in execution an Act [2 Wm. and Mary, Sess. 2, c. 1] for granting 1,651,702l. 18s. 0d." Please send an answer to the said Commissioners that sent the papers. Ibid, p. 60. Same to Mr. Blathwayt. I have read to my Lords your memorial concerning notifying to the Lords Justices of Ireland the Queen's pleasure concerning the provisions and diet furnished to the Army by the inhabitants there. As her Majesty's pleasure herein has been signified "at the Cabinett Council" the Treasury Lords are of opinion it should be transmitted into Ireland by the Secretary of State. Ibid. Same to the Earl of Ranelagh. I have laid before my Lords your memorial containing a [proposed] method of issuing the tallies struck for your Office [of Paymaster of the Forces]. They approve your proposal and desire you to dispose of the tallies accordingly. They desire you to deliver to Lord Fairfax a tally for a quarter due on his annuity at Lady day last. [This latter item cancelled and replaced by the letter of disposition of May 25 infra.] Ibid. Same to Mr. [Charles] Fox. My Lords approve, ut supra, your memorial containing a method of disposing the tallies in your hands for paying the Army in Ireland. They desire you out of the remaining tallies to detain in your hands 1,600l. for Exchequer fees and 500l. to be delivered to Col. La Meloniere on account of his pay, in regard of his late loss. Ibid. William Jephson to the Customs Commissioners to permit the export to Holland, Customs free, of nine horses belonging to Ralph Grey, esq. Out Letters (General) XIII, p. 60. Treasury reference to Mr. Aaron Smith of the petition of Elianor Monfort, shewing that there is 22l. detained by one Vane Rice "by means of her husband's misfortunes" ; and praying it may be paid to her. Reference Book VI, p. 316. Same to the Customs Commissioners of the petition of Edward Randolph, praying the office of Collector and Receiver General of the Customs and Revenue in the Province of New York loco Mr. Brooks, deceased. Ibid, p. 317. Same to Brooke Bridges and Thomas Done, Auditors of Imprests, of the petition of Sir Thomas Duppa, shewing that he was deputed by the late Bishop of Sarum to collect the Tenths of that diocese and paid into the Exchequer on the said late Bishop's last account 168l. 5s. 0½d. more than he collected, which still remains as a surplusage thereon, but the auditors cannot transfer same to the account of the present Bishop without Treasury order : therefore praying a warrant to the auditor to allow said surplusage. Ibid, p. 318. Treasury order, by way of subscription, for the execution of a warrant dated May 11 from the Earl of Dorset, Lord Chamberlain, to Sir Francis Lawley, Master of the Jewel House, to deliver to Lord Lexinton, Ambassador to Spain, 5,893 ounces of white plate and 1,066 ounces of gilt plate, being the allowance heretofore given [to Ambassadors of his rank]. Warrants not Relating to Money XIII, p. 414. Same for same of a same dated May 9 from the said Lord Chamberlain to the said Master to deliver for the service of the Second Troop of Horse Guards commanded by the Duke of Ormonde, two silver trumpets "of the same manner, fashion, quantity and proportion as other his Majesty's trumpets are of." Ibid, p. 415. The Treasury Lords to the Revenue Commissioners, Ireland. We have yours of the 22nd April last concerning the duty on tobacco imported into Ireland by William Squire, with copy of your previous letter of Feb. 24 last relating thereto and an account of tobacco imported there by other persons between 1689, Nov. 1, and 1689-90, Feb. 1. Yet in commiseration of Mr. Squire's great sufferings we desire you to deliver his tobacco duty free : but we do not intend that you should repay any other persons their duty in consequence of this favour to Squire. Out Letters (Ireland) VI, p. 62. William Jephson to Charles Fox. 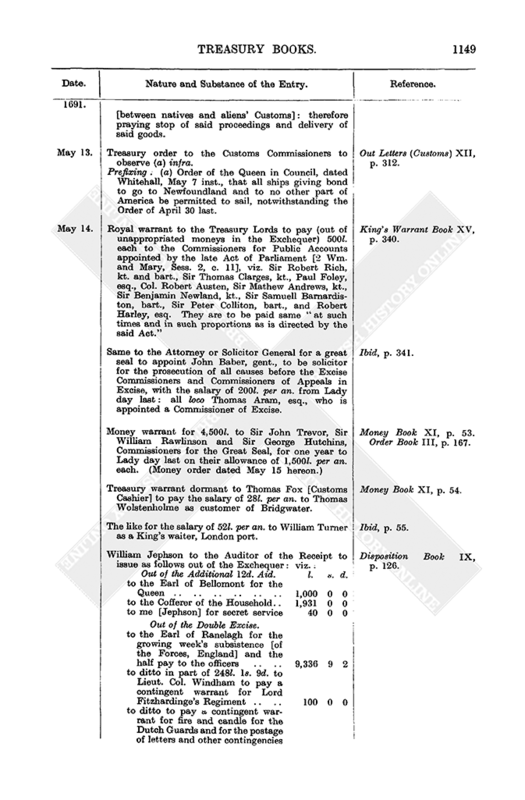 My Lords have considered your report of April 8 last on the petition of Hugh Hulse and Samuel Thorold, apothecaries, and John Cook, instrument maker, for the payment of several sums for medicines, drugs, instruments etc. furnished to several surgeons for several Regiments which are or lately have been in the service of Ireland, viz. as follows : 40l. 19s. 0d. for Visct. Castleton's Regiment ; 20l. 11s. 0d. for Lord Forbes's Regiment and 39l. 3s. 0d. to the same Regiment since the Earl of Meath commanded it ; 25l. 17s. 0d. to Col. [Ferdinando] Hastings' Regiment ; 17l. 11s. 0d. to Col. [Charles] Herbert's Regiment ; 12l. 1s. 0d. to Col. [Francis] Langston's Regiment ; 12l. 10s. 0d. to Sir John Hanmer's Regiment ; 7l. 5s. 0d. to Col. [John] Beaumont's Regiment ; 36l. 15s. 3d. to Col. [Thomas] Erle's Regiment ; 12l. 13s. 5d. to Col. [Edward] Villiers' Regiment ; 5l. 18s. 0d. to the Earl of Drogheda's Regiment ; 35l. 17s. 3d. to Lord Lovelace's Regiment, [which is now] broke ; 13l. 2s. 3d. to Col. [Richard] Cunningham's Regiment. The said sums are vouched by the surgeons and no part thereof is as yet satisfied, as appears by the certificate of William Harbord, late Paymaster of the Forces, Ireland. You are therefore to deduct the said sums out of the arrears due to the said Regiments when they come to be paid, and you are to pay to the said Hulse, Thorold and Cook such sums as you shall so stop from time to time. Out Letters (General) XIII, pp. 68-9. William Jephson to the Auditor of the Receipt to issue to me [Jephson] on any unsatisfied orders in my name for secret service 1,800l. out of loans to be made by Monsieur Hilaire Reneu on credit of the Act [2 Wm. and Mary, Sess. 2, c. 4] for duties on East India goods ; the same being intended for his Majesty's charity to the French Protestants. Disposition Book IX, p. 125. Treasury order, by way of subscription, for the execution of a warrant dated Mar. 26 last from the Earl of Dorset, Lord Chamberlain, to Sir Francis Lawley, Master of the Jewel House, for the delivery to the Earl of Nottingham of 120 ounces of gilt plate, as a gift from the King at the christening of his child. Warrants not Relating to Money XIII, p. 414. Royal warrant to the Attorney or Solicitor General for a great seal to constitute Philip Darcy, Sir Roger Langley, Sir Edward Ayscough, Sir Edmund Jennings, Jo[h]n Parkhurst, Cha. Middleton and Robert Murray to be Principal Commissioners for Prizes in place of the said Darcy, Langley, Ascough, Jennings, Parkhurst, Jo[h]n Carpenter (now deceased) and Middleton, ut supra, p. 1060, with powers ut supra, ibid. : but none of the salary of the said Murray to be paid him till the arrears of salary due to the executors of said Carpenter be satisfied. John Dive is hereby continued and appointed secretary to the said Commissioners at 500l. per an. salary. King's Warrant Book XV, pp. 342-4. William Jephson to the Auditor of the Receipt to issue 20,000l. to the Treasurer of the Navy out of the loans on the Twelve Months' Aid. Disposition Book IX, p. 125. Same to Mr. Blathwayte [as Secretary to the Forces] to procure a royal warrant to be signed by the Queen to authorise Charles Fox and Thomas Coningsby, Paymasters of the Forces in Ireland, to pay 300l. to the Reformed Officers of the French Regiment of Horse for the buying of horses. Out Letters (General) XIII, p. 61. William Jephson to Lord Willoughby. My Lords are informed that in the forest or chase of Needwood, co. Stafford, part of the Duchy of Lancaster, there are great wastes committed by felling and cutting down timber and wood and lopping trees on pretence of browsing for the deer, "but indeed converting the same to their [the officials'] own use," and that the same is done as well by the officials as by others of the country. Further, my Lords are informed that there are good quantities of timber fit for the Navy [in said forest] and particularly that the timber there affords many crooks and knee timber ; also that Mr. Smyth, proprietor of the herbage of Hanbury Park, a member of the said forest, has already felled 20 trees there and intends to fell 400 or 500 more very shortly : likewise Lord Dartmouth's tenants in Tutbury Castle Hayes have stubbed up some thousands of oak trees and converted the land to tillage. You are to examine into this matter in order to its being laid before the Queen. Out Letters (General) XIII, p. 61. Same to the [Principal] Officers of the Ordnance to report on the enclosed account from Mr. Bowles concerning his admeasurement of the ship Mary Catt, which was employed in the King's service by your Board. Ibid, p. 62. Same to the Commissioners of Transports not to pay any money to any of the transport ships until they produce to you a certificate from Mr. Bowles that they have been re-measured by him or his agents. Ibid. Treasury reference to the Customs Commissioners of the petition of [several] merchants of Bristol, proposing to pay the duty of all the tobacco smuggled at the scale and by burning the books and making new [ones], which [frauds] "they make amount to about 2,772l. upon the [tobacco in the ship] Bristol Merchant and the ship Factor ; and all the King's charges [to be paid by them : they] having their agents, Smith and Sawyer, forgiven and to deliver up their books to be perused by which they make up their accounts" and [offering to] discover what they know about the officers : and desire, the better to enable them to so obtain their money from Byron the jerquer, to have his bond given them and they will engage to prosecute it. Reference Book VI, p. 317. Same to the Excise Commissioners of the petition of Thos. Leech and Eliz. Spencer, widow [of] Tho. Speneer ; shewing that said Leech and Thomas Spencer were surety for William Johnson, collector of Hearthmoney in co. Cambridge, who absconded and is indebted 277l. 16s. 2d. to the King : and praying to be released from the security, as they are much impoverished. Ibid. Same to the Customs Commissioners of the petition of William Richardson of London, merchant, shewing that his servant had a small venture of copper lately come from Barbary, which petitioner bought before landing, "and therefore entered it in his own name, altho' his said servant is a stranger," for which reason the copper is seized and petitioner is threatened to be prosecuted for the difference [between natives and aliens' Customs] : therefore praying stop of said proceedings and delivery of said goods. Ibid. Treasury order to the Customs Commissioners to observe (a) infra. Prefixing : (a) Order of the Queen in Council, dated Whitehall, May 7 inst., that all ships giving bond to go to Newfoundland and to no other part of America be permitted to sail, notwithstanding the Order of April 30 last. Out Letters (Customs) XII, p. 312. Royal warrant to the Treasury Lords to pay (out of unappropriated moneys in the Exchequer) 500l. each to the Commissioners for Public Accounts appointed by the late Act of Parliament [2 Wm. and Mary, Sess. 2, c. 11], viz. Sir Robert Rich, kt. and bart., Sir Thomas Clarges, kt., Paul Foley, esq., Col. Robert Austen, Sir Mathew Andrews, kt., Sir Benjamin Newland, kt., Sir Samuell Barnardiston, bart., Sir Peter Colliton, bart., and Robert Harley, esq. They are to be paid same "at such times and in such proportions as is directed by the said Act." King's Warrant Book XV, p. 340. Same to the Attorney or Solicitor General for a great seal to appoint John Baber, gent., to be solicitor for the prosecution of all causes before the Excise Commissioners and Commissioners of Appeals in Excise, with the salary of 200l. per an. from Lady day last : all loco Thomas Aram, esq., who is appointed a Commissioner of Excise. Ibid, p. 341. Money warrant for 4,500l. to Sir John Trevor, Sir William Rawlinson and Sir George Hutchins, Commissioners for the Great Seal, for one year to Lady day last on their allowance of 1,500l. per an. each. (Money order dated May 15 hereon.) Money Book XI, p. 53. Order Book III, p. 167. Treasury warrant dormant to Thomas Fox [Customs Cashier] to pay the salary of 28l. per an. to Thomas Wolstenholme as customer of Bridgwater. Money Book XI, p. 54. The like for the salary of 52l. per an. to William Turner as a King's waiter, London port. Ibid, p. 55. William Jephson to the Auditor of the Receipt to issue as follows out of the Exchequer : viz. : Disposition Book IX, p. 126. Out of the Additional 12d. Aid. Out of the Double Excise. Out of Wine Licence money. William Jephson to the Auditor of the Receipt to issue 5,375l. to Visct. Newport, Cofferer of the Household, out of the loans on the Hereditary Excise and the fourth of the Temporary Excise. Disposition Book IX, p. 126. Same to same to issue 500l. to Charles Fox and Thomas Coningsby out of any disposable unappropriated money in the Exchequer. (Same to said Fox and Coningsby to pay same to such person as the Duke of Leinster shall direct, as in part of 1,500l. for buying horses for recruiting the Danish Regiments. Take care it be placed to the account of the Danish Troops.) Ibid, p. 127. Same to Mr. Harbord [as Surveyor General of Crown Lands] to report on the proposals [missing] of Robert Forder and Thomas Cobbe for a lease of their Majesties' lands near Winchester. My Lords desire you [and] Sir Christopher Wren to send them a state of the debt for the buildings there. Out Letters (General) XIII, p. 62. Same to Mr. [Charles] Fox. I have read to my Lords your report of the 6th inst. on the petition of several tradesmen who clothed the Regiment of Horse late under Lord George Hewyt. My Lords agree that petitioners ought to be paid out of the tallies for the offreckonings [of said Regiment] to Jan. 1 last. You are to deliver the tallies to them accordingly. Ibid. Same to the Customs Commissioners to permit the export to Ireland, Customs free, of goods for the Duke of Wurtemberg. Appending : schedule of said goods (dried sweetmeats, wet sweetmeats, comfits, stock fish, cloth, capers, Vermigelly Truttes, Morills, wines etc.). (Same to the Revenue Commissioners, Ireland, dated May 13, to permit the import of same into Ireland, Customs free.) Ibid, pp. 62-3. Order Book III, p. 62. 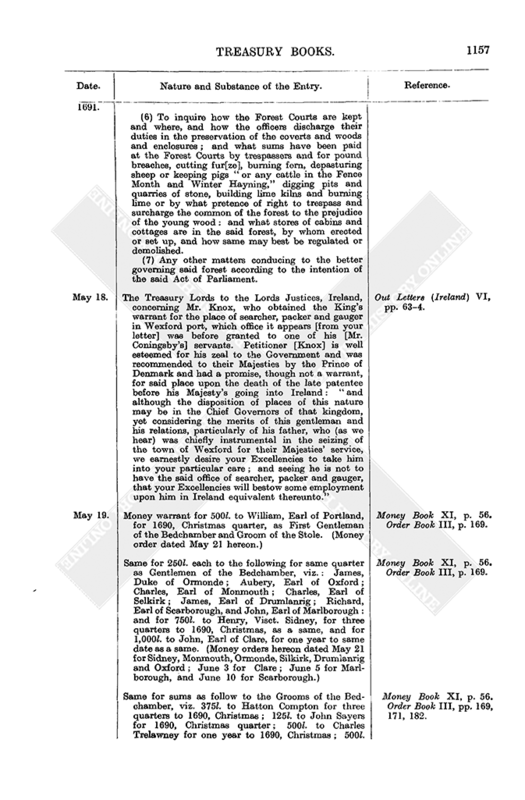 Same to Mr. Sotherne [Secretary to the Admiralty] to lay before the Admiralty Lords the enclosed presentment [missing] from the Customs Commissioners concerning an abuse and assault committed by Lieut. Harwood, of the King's ship Hampton Court, on two [Customs] officers at Deal and forcibly carrying away from the ship Tiger six casks containing 12 gallons each, and pressing Joseph Williams, an officer of the Customs, for endeavouring to secure the said casks. Out Letters (General) XIII, p. 63. William Jephson to the Customs Commissioners to permit three horses belonging to Lord Lisburne to be exported to Ireland, Customs free. (Same to the Revenue Commissioners, Ireland, to permit the Customs free import of same into Ireland.) Out Letters (General) XIII, p. 63. Out Letters (Ireland) VI, p. 63. 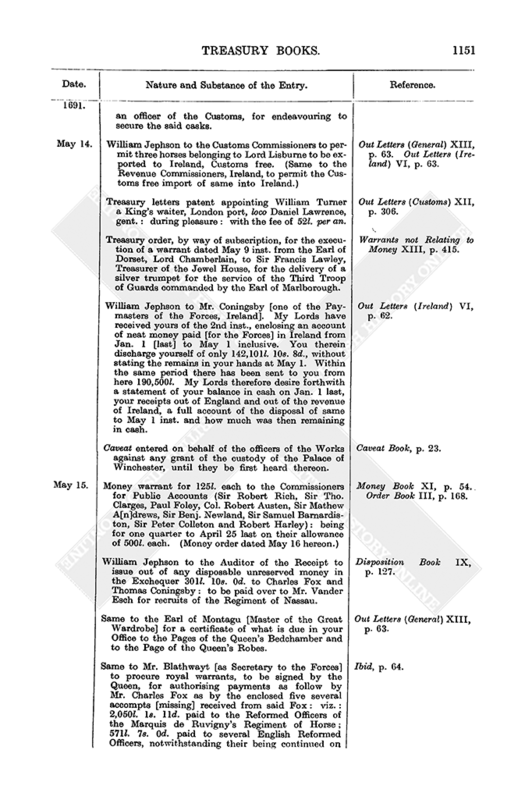 Treasury letters patent appointing William Turner a King's waiter, London port, loco Daniel Lawrence, gent. : during pleasure : with the fee of 52l. per an. Out Letters (Customs) XII, p. 306. Treasury order, by way of subscription, for the execution of a warrant dated May 9 inst. from the Earl of Dorset, Lord Chamberlain, to Sir Francis Lawley, Treasurer of the Jewel House, for the delivery of a silver trumpet for the service of the Third Troop of Guards commanded by the Earl of Marlborough. Warrants not Relating to Money XIII, p. 415. William Jephson to Mr. Coningsby [one of the Paymasters of the Forces, Ireland]. My Lords have received yours of the 2nd inst., enclosing an account of neat money paid [for the Forces] in Ireland from Jan. 1 [last] to May 1 inclusive. You therein discharge yourself of only 142,101l. 10s. 8d., without stating the remains in your hands at May 1. Within the same period there has been sent to you from here 190,500l. My Lords therefore desire forthwith a statement of your balance in cash on Jan. 1 last, your receipts out of England and out of the revenue of Ireland, a full account of the disposal of same to May 1 inst. and how much was then remaining in cash. Out Letters (Ireland) VI, p. 62. Caveat entered on behalf of the officers of the Works against any grant of the custody of the Palace of Winchester, until they be first heard thereon. Caveat Book, p. 23. Money warrant for 125l. each to the Commissioners for Public Accounts (Sir Robert Rich, Sir Tho. Clarges, Paul Foley, Col. Robert Austen, Sir Mathew A[n]drews, Sir Benj. Newland, Sir Samuel Barnardiston, Sir Peter Colleton and Robert Harley) : being for one quarter to April 25 last on their allowance of 500l. each. (Money order dated May 16 hereon.) Money Book XI, p. 54. Order Book III, p. 168. William Jephson to the Auditor of the Receipt to issue out of any disposable unreserved money in the Exchequer 301l. 10s. 0d. to Charles Fox and Thomas Coningsby : to be paid over to Mr. Vander Esch for recruits of the Regiment of Nassau. Disposition Book IX, p. 127. Same to the Earl of Montagu [Master of the Great Wardrobe] for a certificate of what is due in your Office to the Pages of the Queen's Bedchamber and to the Page of the Queen's Robes. Out Letters (General) XIII, p. 63. Same to Mr. Blathwayt [as Secretary to the Forces] to procure royal warrants, to be signed by the Queen, for authorising payments as follow by Mr. Charles Fox as by the enclosed five several accompts [missing] received from said Fox : viz. : 2,050l. 1s. 11d. paid to the Reformed Officers of the Marquis de Ruvigny's Regiment of Horse ; 571l. 7s. 0d. paid to several English Reformed Officers, notwithstanding their being continued on the establishment, and to Dr. Fairclough (in the margin : this to be respited till further signification) ; 891l. 0s. 2d. paid to the Reformed Officers of Col. Bellcastle's Regiment of Foot ; 994l. 11s. 0d. paid to ditto of Col. Du Cambon's Regiment of Foot ; 1,374l. 5s. 9½d. paid to ditto of Brigadier La Melonier's Regiment of Foot. Ibid, p. 64. William Jephson to the Commissioners for Coining Tin Farthings. My Lords have read your memorial of the 4th inst. concerning the disposal of farthings and halfpence with least charge to the King and without grievance to the people and desiring directions about the quantities of the said coins to be provided for Ireland and the Plantations. My Lords leave it to you to disperse the said coins as you shall think best. You are to cause the said coins to be coined as fast as may be for the service of Ireland. Out Letters (General) XIII, p. 65. The Treasury Lords to the King. In accordance with your commands left with us at your going hence we have treated with Sir Joseph Herne for the constant return [forwarding by bill of exchange] of the weekly subsistence for the [English] Forces in Flanders and the monthly payment of 3,600l. for the Wolfenbuttel Troops [Herne furnishing bills] upon credit of tallies. We have received from him a proposal by which he undertakes to return the money for the Forces in Flanders and to pay them the same value of the money by which they have hitherto been paid there and to give credit for 3,600l. per month for four months for the Wolfenbuttel Troops without demanding anything for commission money and himself to be at all charge and hazard, "upon which we have come to an agreement with the said Sir Joseph unless your Majesty shall think fit to send us any directions to the contrary." We desire your Majesty to signify your pleasure to Monsieur Schulenberg to forthwith prepare and transmit to us an account of all the bills he has drawn on the Earl of Ranelagh for the pay of any of your Majesty's Forces in Flanders from 1689-90, April 26, to the 1st inst. 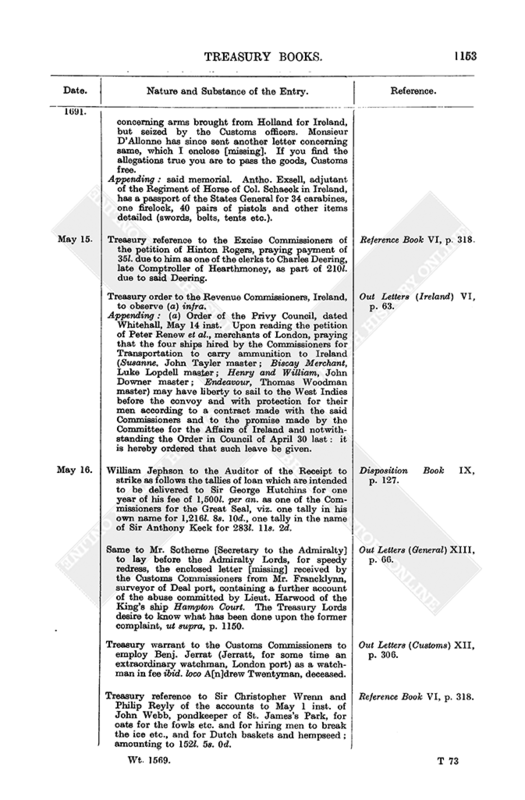 old style, according to our letter to said Schulenberg by this post ; and particularly to note in his said account the sums he has stopped or received on each bill for exchange losses or charges and how he has disposed of the money. Also we desire an establishment or a copy of the establishment of the Wolfenbuttel Troops. We have lately countersigned an establishment of double pay to the [? officers of the] First and Second Regiments of Guards, the grounds whereof, we are informed, are that the Dutch Guards have the same and have no servants allowed them. We humbly offer it to your Majesty's consideration whether in regard of this increase of their pay it be not reasonable that the officers should not have any servants allowed them likewise in their musters for the future. Ibid, pp. 65-6. Same to Monsieur Schulenberg, requesting the account of bills as above. Ibid, p. 67. William Jephson to the Customs Commissioners. My Lords have referred to you a memorial in (a) infra concerning arms brought from Holland for Ireland, but seized by the Customs officers. Monsieur D'Allonne has since sent another letter concerning same, which I enclose [missing]. If you find the allegations true you are to pass the goods, Customs free. Appending : said memorial. Antho. Exsell, adjutant of the Regiment of Horse of Col. Schaeck in Ireland, has a passport of the States General for 34 carabines, one firelock, 40 pairs of pistols and other items detailed (swords, belts, tents etc.). Ibid. 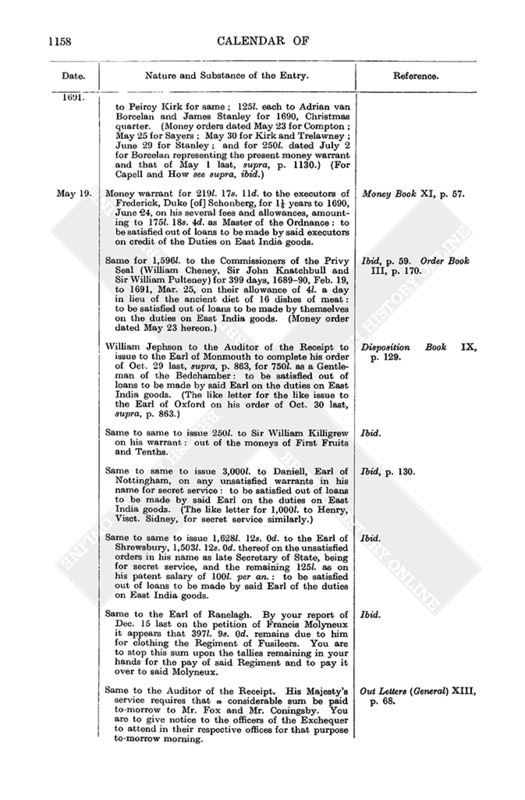 Treasury reference to the Excise Commissioners of the petition of Hinton Rogers, praying payment of 35l. due to him as one of the clerks to Charles Deering, late Comptroller of Hearthmoney, as part of 210l. due to said Deering. Reference Book VI, p. 318. Treasury order to the Revenue Commissioners, Ireland, to observe (a) infra. 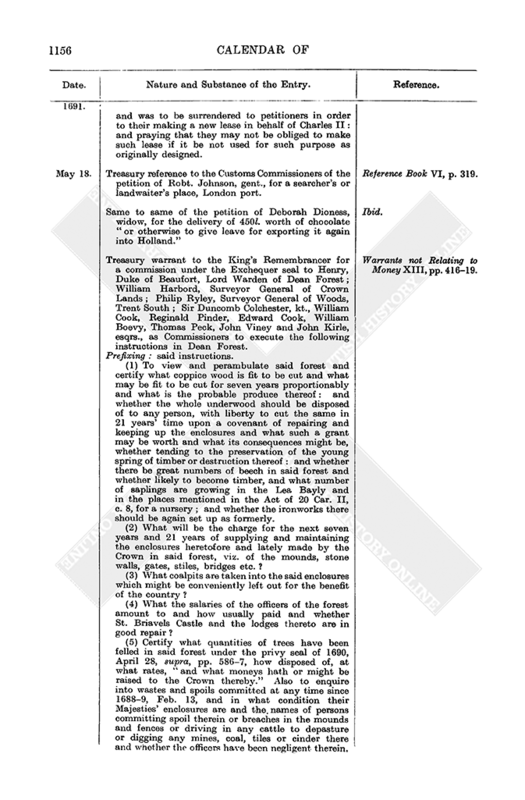 Appending : (a) Order of the Privy Council, dated Whitehall, May 14 inst. 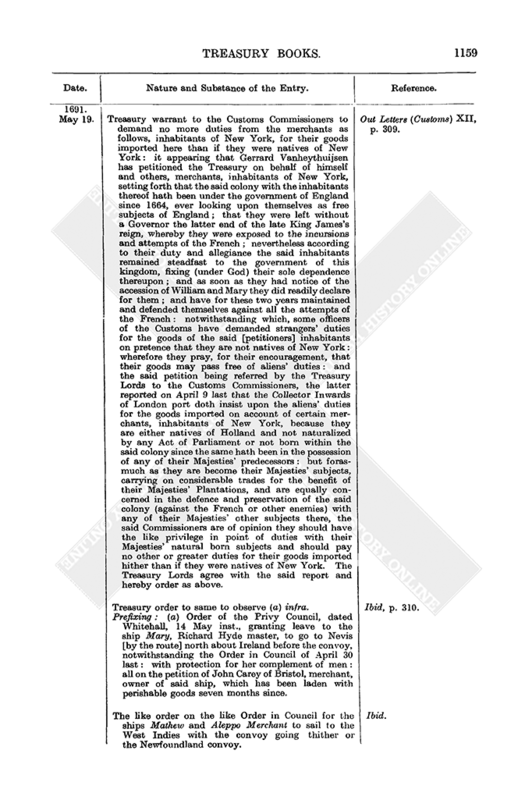 Upon reading the petition of Peter Renew et al., merchants of London, praying that the four ships hired by the Commissioners for Transportation to carry ammunition to Ireland (Susanne, John Tayler master ; Biscay Merchant, Luke Lopdell master ; Henry and William, John Downer master ; Endeavour, Thomas Woodman master) may have liberty to sail to the West Indies before the convoy and with protection for their men according to a contract made with the said Commissioners and to the promise made by the Committee for the Affairs of Ireland and notwithstanding the Order in Council of April 30 last : it is hereby ordered that such leave be given. Out Letters (Ireland) VI, p. 63. 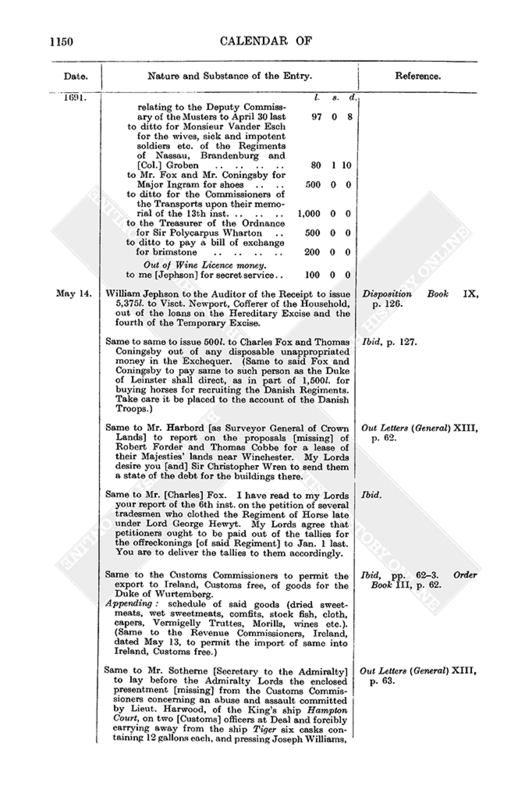 William Jephson to the Auditor of the Receipt to strike as follows the tallies of loan which are intended to be delivered to Sir George Hutchins for one year of his fee of 1,500l. per an. as one of the Commissioners for the Great Seal, viz. one tally in his own name for 1,216l. 8s. 10d., one tally in the name of Sir Anthony Keck for 283l. 11s. 2d. Disposition Book IX, p. 127. 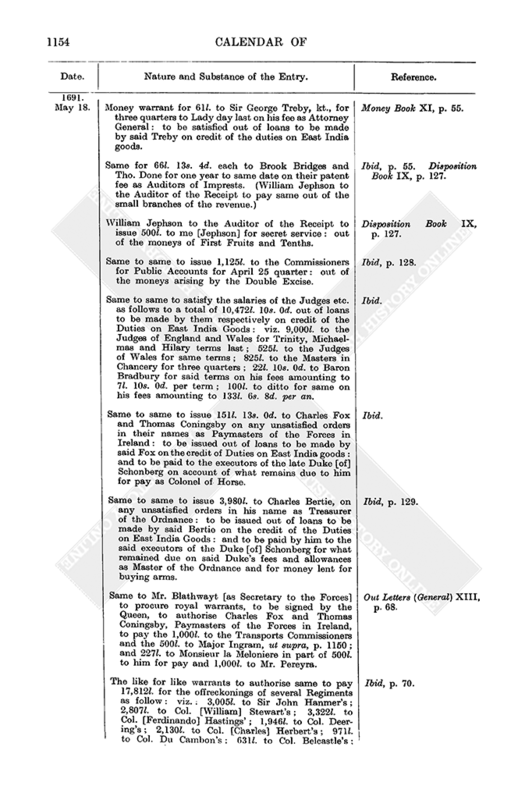 Same to Mr. Sotherne [Secretary to the Admiralty] to lay before the Admiralty Lords, for speedy redress, the enclosed letter [missing] received by the Customs Commissioners from Mr. Francklynn, surveyor of Deal port, containing a further account of the abuse committed by Lieut. Harwood of the King's ship Hampton Court. The Treasury Lords desire to know what has been done upon the former complaint, ut supra, p. 1150. Out Letters (General) XIII, p. 66. Treasury warrant to the Customs Commissioners to employ Benj. Jerrat (Jerratt, for some time an extraordinary watchman, London port) as a watchman in fee ibid. loco A[n]drew Twentyman, deceased. Out Letters (Customs) XII, p. 306. Treasury reference to Sir Christopher Wrenn and Philip Reyly of the accounts to May 1 inst. of John Webb, pondkeeper of St. James's Park, for oats for the fowls etc. and for hiring men to break the ice etc., and for Dutch baskets and hempseed ; amounting to 152l. 5s. 0d. Reference Book VI, p. 318. Money warrant for 61l. to Sir George Treby, kt., for three quarters to Lady day last on his fee as Attorney General : to be satisfied out of loans to be made by said Treby on credit of the duties on East India goods. Money Book XI, p. 55. Same for 66l. 13s. 4d. each to Brook Bridges and Tho. Done for one year to same date on their patent fee as Auditors of Imprests. (William Jephson to the Auditor of the Receipt to pay same out of the small branches of the revenue.) Ibid, p. 55. Disposition Book IX, p. 127. William Jephson to the Auditor of the Receipt to issue 500l. to me [Jephson] for secret service : out of the moneys of First Fruits and Tenths. Disposition Book IX, p. 127. Same to same to issue 1,125l. to the Commissioners for Public Accounts for April 25 quarter : out of the moneys arising by the Double Excise. Ibid, p. 128. Same to same to satisfy the salaries of the Judges etc. as follows to a total of 10,472l. 10s. 0d. out of loans to be made by them respectively on credit of the Duties on East India Goods : viz. 9,000l. to the Judges of England and Wales for Trinity, Michaelmas and Hilary terms last ; 525l. to the Judges of Wales for same terms ; 825l. to the Masters in Chancery for three quarters ; 22l. 10s. 0d. to Baron Bradbury for said terms on his fees amounting to 7l. 10s. 0d. per term ; 100l. to ditto for same on his fees amounting to 133l. 6s. 8d. per an. Ibid. Same to same to issue 151l. 13s. 0d. to Charles Fox and Thomas Coningsby on any unsatisfied orders in their names as Paymasters of the Forces in Ireland : to be issued out of loans to be made by said Fox on the credit of Duties on East India goods : and to be paid to the executors of the late Duke [of] Schonberg on account of what remains due to him for pay as Colonel of Horse. Ibid. Same to same to issue 3,980l. to Charles Bertie, on any unsatisfied orders in his name as Treasurer of the Ordnance : to be issued out of loans to be made by said Bertie on the credit of the Duties on East India Goods : and to be paid by him to the said executors of the Duke [of] Schonberg for what remained due on said Duke's fees and allowances as Master of the Ordnance and for money lent for buying arms. Ibid, p. 129. Same to Mr. Blathwayt [as Secretary to the Forces] to procure royal warrants, to be signed by the Queen, to authorise Charles Fox and Thomas Coningsby, Paymasters of the Forces in Ireland, to pay the 1,000l. to the Transports Commissioners and the 500l. to Major Ingram, ut supra, p. 1150 ; and 227l. to Monsieur la Meloniere in part of 500l. to him for pay and 1,000l. to Mr. Pereyra. Out Letters (General) XIII, p. 68. The like for like warrants to authorise same to pay 17,812l. for the offreckonings of several Regiments as follow : viz. : 3,005l. to Sir John Hanmer's ; 2,807l. to Col. [William] Stewart's ; 3,322l. to Col. [Ferdinando] Hastings' ; 1,946l. to Col. Deering's ; 2,130l. to Col. [Charles] Herbert's ; 971l. to Col. Du Cambon's ; 631l. to Col. Belcastle's ; 3,000l. to be advanced to the Royal Regiment of Horse [and the Regiments of Major General] Kirke and [Col. Charles] Trelawney, to wit 1,000l. each. Ibid, p. 70. Treasury warrant to the Customs Commissioners to accept a composition of 2,772l. from the merchants of Bristol port for the [tobacco duty] frauds upon the two ships Factor and Bristol Merchant, as by the memorial of Mr. Colt, collector of Bristol port, and of Mr. Hutchinson, solicitor of the Customs : "in regard it is not only as much as may be probably recovered by a prosecution at law, but also will let you into a more certain knowledge of the officers and a further discovery of frauds." The 263l. 16s. 6d. which was received by Mr. Rowe, the chief discoverer of the frauds, as a private reward from the merchants, is to be accounted a part of the said 2,772l., and is to be accepted by Rowe as part of his recompense from the King. Out Letters (Customs) XII, p. 307. Same to the Attorney General and to the Customs Commissioners to enter a noli prosequi upon the information against a small venture of copper imported from Barbary by a servant of William Richardson of London, merchant, which the said Richarsdon bought of him before landing and unadvisedly entered with his other goods in his own name, whereas the said servant is a stranger [and should therefore have paid aliens' duties thereon] ; the difference in the Customs being only 6s. 9d. : said Richardson being reported to be a merchant of good credit and a fair trader in the port of London and pays considerable Customs to the King. Ibid. Same to same to direct the collectors of the outports [for the outports officers] and the Receiver General of Customs [for the London port officers] to pay the taxes assessed upon salaries of officers below 60l. per an. on the Twelve Months' Aid [2 Wm. and Mary, Sess. 2, c. 1] and to reimburse to such officers any money already paid by them thereon : all in accordance with the said Commissioners' memorial of the 22nd inst. [ult.]. Ibid, p. 308. 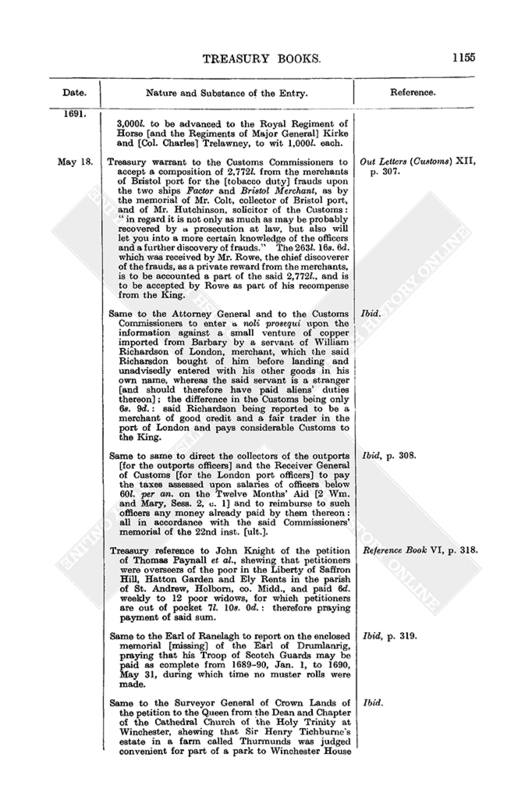 Treasury reference to John Knight of the petition of Thomas Paynall et al., shewing that petitioners were overseers of the poor in the Liberty of Saffron Hill, Hatton Garden and Ely Rents in the parish of St. Andrew, Holborn, co. Midd., and paid 6d. weekly to 12 poor widows, for which petitioners are out of pocket 7l. 10s. 0d. : therefore praying payment of said sum. Reference Book VI, p. 318. Same to the Earl of Ranelagh to report on the enclosed memorial [missing] of the Earl of Drumlanrig, praying that his Troop of Scotch Guards may be paid as complete from 1689-90, Jan. 1, to 1690, May 31, during which time no muster rolls were made. Ibid, p. 319. Same to the Surveyor General of Crown Lands of the petition to the Queen from the Dean and Chapter of the Cathedral Church of the Holy Trinity at Winchester, shewing that Sir Henry Tichburne's estate in a farm called Thurmunds was judged convenient for part of a park to Winchester House and was to be surrendered to petitioners in order to their making a new lease in behalf of Charles II : and praying that they may not be obliged to make such lease if it be not used for such purpose as originally designed. Ibid. 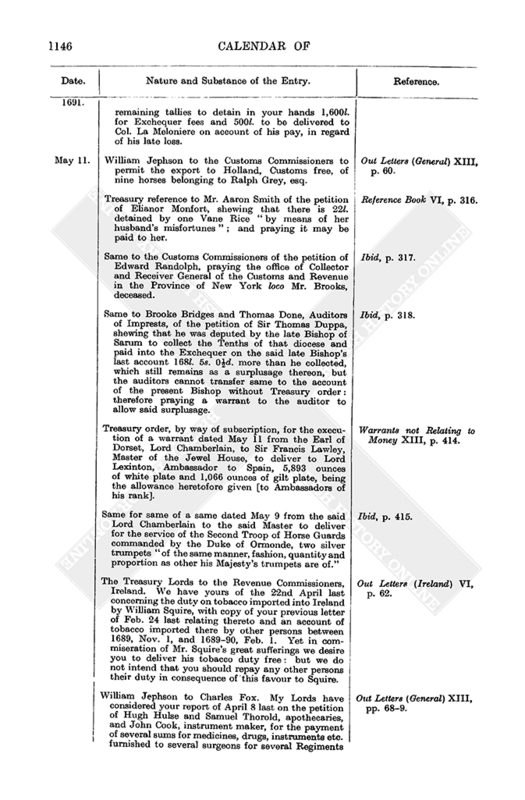 Treasury reference to the Customs Commissioners of the petition of Robt. Johnson, gent., for a searcher's or landwaiter's place, London port. Reference Book VI, p. 319. Same to same of the petition of Deborah Dioness, widow, for the delivery of 450l. worth of chocolate "or otherwise to give leave for exporting it again into Holland." Ibid. Treasury warrant to the King's Remembrancer for a commission under the Exchequer seal to Henry, Duke of Beaufort, Lord Warden of Dean Forest ; William Harbord, Surveyor General of Crown Lands ; Philip Ryley, Surveyor General of Woods, Trent South ; Sir Duncomb Colchester, kt., William Cook, Reginald Pinder, Edward Cook, William Boevy, Thomas Peck, John Viney and John Kirle, esqrs., as Commissioners to execute the following instructions in Dean Forest. Prefixing : said instructions. Warrants not Relating to Money XIII, pp. 416-19. (1) To view and perambulate said forest and certify what coppice wood is fit to be cut and what may be fit to be cut for seven years proportionably and what is the probable produce thereof : and whether the whole underwood should be disposed of to any person, with liberty to cut the same in 21 years' time upon a covenant of repairing and keeping up the enclosures and what such a grant may be worth and what its consequences might be, whether tending to the preservation of the young spring of timber or destruction thereof : and whether there be great numbers of beech in said forest and whether likely to become timber, and what number of saplings are growing in the Lea Bayly and in the places mentioned in the Act of 20 Car. II, c. 8, for a nursery ; and whether the ironworks there should be again set up as formerly. (2) What will be the charge for the next seven years and 21 years of supplying and maintaining the enclosures heretofore and lately made by the Crown in said forest, viz. of the mounds, stone walls, gates, stiles, bridges etc.? (3) What coalpits are taken into the said enclosures which might be conveniently left out for the benefit of the country? (4) What the salaries of the officers of the forest amount to and how usually paid and whether St. Briavels Castle and the lodges thereto are in good repair? (5) Certify what quantities of trees have been felled in said forest under the privy seal of 1690, April 28, supra, pp. 586-7, how disposed of, at what rates, "and what moneys hath or might be raised to the Crown thereby." Also to enquire into wastes and spoils committed at any time since 1688-9, Feb. 13, and in what condition their Majesties' enclosures are and the names of persons committing spoil therein or breaches in the mounds and fences or driving in any cattle to depasture or digging any mines, coal, tiles or cinder there and whether the officers have been negligent therein. (6) To inquire how the Forest Courts are kept and where, and how the officers discharge their duties in the preservation of the coverts and woods and enclosures ; and what sums have been paid at the Forest Courts by trespassers and for pound breaches, cutting fur[ze], burning fern, depasturing sheep or keeping pigs "or any cattle in the Fence Month and Winter Hayning," digging pits and quarries of stone, building lime kilns and burning lime or by what pretence of right to trespass and surcharge the common of the forest to the prejudice of the young wood : and what stores of cabins and cottages are in the said forest, by whom erected or set up, and how same may best be regulated or demolished. (7) Any other matters conducing to the better governing said forest according to the intention of the said Act of Parliament. The Treasury Lords to the Lords Justices, Ireland, concerning Mr. Knox, who obtained the King's warrant for the place of searcher, packer and gauger in Wexford port, which office it appears [from your letter] was before granted to one of his [Mr. Coningsby's] servants. Petitioner [Knox] is well esteemed for his zeal to the Government and was recommended to their Majesties by the Prince of Denmark and had a promise, though not a warrant, for said place upon the death of the late patentee before his Majesty's going into Ireland : "and although the disposition of places of this nature may be in the Chief Governors of that kingdom, yet considering the merits of this gentleman and his relations, particularly of his father, who (as we hear) was chiefly instrumental in the seizing of the town of Wexford for their Majesties' service, we earnestly desire your Excellencies to take him into your particular care ; and seeing he is not to have the said office of searcher, packer and gauger, that your Excellencies will bestow some employment upon him in Ireland equivalent thereunto." Out Letters (Ireland) VI, pp. 63-4. Money warrant for 500l. to William, Earl of Portland, for 1690, Christmas quarter, as First Gentleman of the Bedchamber and Groom of the Stole. (Money order dated May 21 hereon.) Money Book XI, p. 56. Order Book III, p. 169. Same for 250l. each to the following for same quarter as Gentlemen of the Bedchamber, viz. : James, Duke of Ormonde ; Aubery, Earl of Oxford ; Charles, Earl of Monmouth ; Charles, Earl of Selkirk ; James, Earl of Drumlanrig ; Richard, Earl of Scarborough, and John, Earl of Marlborough : and for 750l. to Henry, Visct. Sidney, for three quarters to 1690, Christmas, as a same, and for 1,000l. to John, Earl of Clare, for one year to same date as a same. 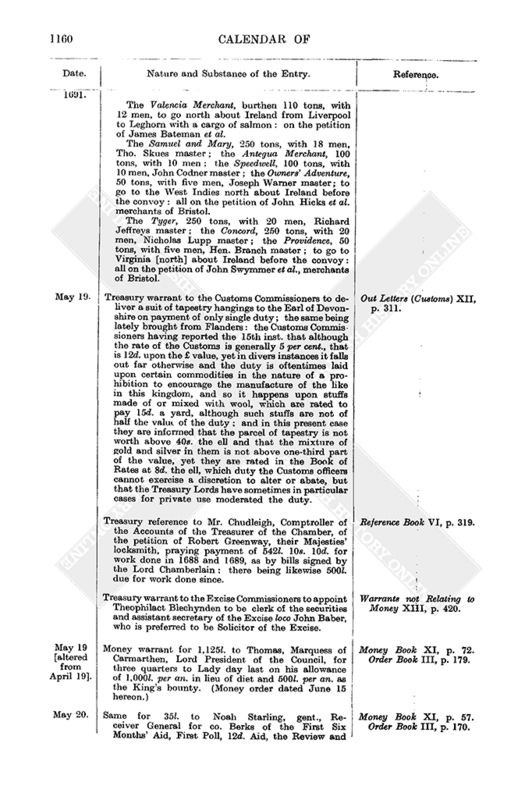 (Money orders hereon dated May 21 for Sidney, Monmouth, Ormonde, Silkirk, Drumlanrig and Oxford ; June 3 for Clare ; June 5 for Marlborough, and June 10 for Scarborough.) Money Book XI, p. 56. Order Book III, p. 169. Same for sums as follow to the Grooms of the Bedchamber, viz. 375l. to Hatton Compton for three quarters to 1690, Christmas ; 125l. to John Sayers for 1690, Christmas quarter ; 500l. to Charles Trelawney for one year to 1690, Christmas ; 500l. to Peircy Kirk for same ; 125l. each to Adrian van Borcelan and James Stanley for 1690, Christmas quarter. 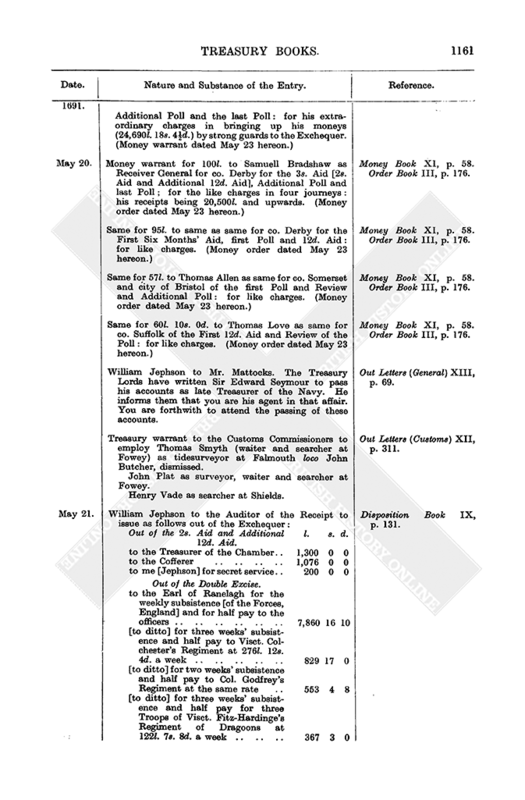 (Money orders dated May 23 for Compton ; May 25 for Sayers ; May 30 for Kirk and Trelawney ; June 29 for Stanley ; and for 250l. dated July 2 for Borcelan representing the present money warrant and that of May 1 last, supra, p. 1130.) (For Capell and How see supra, ibid.) Money Book XI, p. 56. Order Book III, pp. 169, 171, 182. Money warrant for 219l. 17s. 11d. to the executors of Frederick, Duke [of] Schonberg, for 1¼ years to 1690, June 24, on his several fees and allowances, amounting to 175l. 18s. 4d. as Master of the Ordnance : to be satisfied out of loans to be made by said executors on credit of the Duties on East India goods. Money Book XI, p. 57. Same for 1,596l. to the Commissioners of the Privy Seal (William Cheney, Sir John Knatchbull and Sir William Pulteney) for 399 days, 1689-90, Feb. 19, to 1691, Mar. 25, on their allowance of 4l. a day in lieu of the ancient diet of 16 dishes of meat : to be satisfied out of loans to be made by themselves on the duties on East India goods. (Money order dated May 23 hereon.) Ibid, p. 59. Order Book III, p. 170. William Jephson to the Auditor of the Receipt to issue to the Earl of Monmouth to complete his order of Oct. 29 last, supra, p. 863, for 750l. as a Gentleman of the Bedchamber : to be satisfied out of loans to be made by said Earl on the duties on East India goods. (The like letter for the like issue to the Earl of Oxford on his order of Oct. 30 last, supra, p. 863.) Disposition Book IX, p. 129. Same to same to issue 250l. to Sir William Killigrew on his warrant : out of the moneys of First Fruits and Tenths. Ibid. Same to same to issue 3,000l. to Daniell, Earl of Nottingham, on any unsatisfied warrants in his name for secret service : to be satisfied out of loans to be made by said Earl on the duties on East India goods. (The like letter for 1,000l. to Henry, Visct. Sidney, for secret service similarly.) Ibid, p. 130. Same to same to issue 1,628l. 12s. 0d. to the Earl of Shrewsbury, 1,503l. 12s. 0d. thereof on the unsatisfied orders in his name as late Secretary of State, being for secret service, and the remaining 125l. as on his patent salary of 100l. per an. : to be satisfied out of loans to be made by said Earl of the duties on East India goods. Ibid. Same to the Earl of Ranelagh. By your report of Dec. 15 last on the petition of Francis Molyneux it appears that 397l. 9s. 0d. remains due to him for clothing the Regiment of Fusileers. You are to stop this sum upon the tallies remaining in your hands for the pay of said Regiment and to pay it over to said Molyneux. Ibid. Same to the Auditor of the Receipt. His Majesty's service requires that a considerable sum be paid to-morrow to Mr. Fox and Mr. Coningsby. You are to give notice to the officers of the Exchequer to attend in their respective offices for that purpose to-morrow morning. Out Letters (General) XIII, p. 68. Treasury warrant to the Customs Commissioners to demand no more duties from the merchants as follows, inhabitants of New York, for their goods imported here than if they were natives of New York : it appearing that Gerrard Vanheythuijsen has petitioned the Treasury on behalf of himself and others, merchants, inhabitants of New York, setting forth that the said colony with the inhabitants thereof hath been under the government of England since 1664, ever looking upon themselves as free subjects of England ; that they were left without a Governor the latter end of the late King James's reign, whereby they were exposed to the incursions and attempts of the French ; nevertheless according to their duty and allegiance the said inhabitants remained steadfast to the government of this kingdom, fixing (under God) their sole dependence thereupon ; and as soon as they had notice of the accession of William and Mary they did readily declare for them ; and have for these two years maintained and defended themselves against all the attempts of the French : notwithstanding which, some officers of the Customs have demanded strangers' duties for the goods of the said [petitioners] inhabitants on pretence that they are not natives of New York : wherefore they pray, for their encouragement, that their goods may pass free of aliens' duties : and the said petition being referred by the Treasury Lords to the Customs Commissioners, the latter reported on April 9 last that the Collector Inwards of London port doth insist upon the aliens' duties for the goods imported on account of certain merchants, inhabitants of New York, because they are either natives of Holland and not naturalized by any Act of Parliament or not born within the said colony since the same hath been in the possession of any of their Majesties' predecessors : but forasmuch as they are become their Majesties' subjects, carrying on considerable trades for the benefit of their Majesties' Plantations, and are equally concerned in the defence and preservation of the said colony (against the French or other enemies) with any of their Majesties' other subjects there, the said Commissioners are of opinion they should have the like privilege in point of duties with their Majesties' natural born subjects and should pay no other or greater duties for their goods imported hither than if they were natives of New York. The Treasury Lords agree with the said report and hereby order as above. Out Letters (Customs) XII, p. 309. Treasury order to same to observe (a) infra. Prefixing : (a) Order of the Privy Council, dated Whitehall, 14 May inst., granting leave to the ship Mary, Richard Hyde master, to go to Nevis [by the route] north about Ireland before the convoy, notwithstanding the Order in Council of April 30 last : with protection for her complement of men : all on the petition of John Carey of Bristol, merchant, owner of said ship, which has been laden with perishable goods seven months since. Ibid, p. 310. 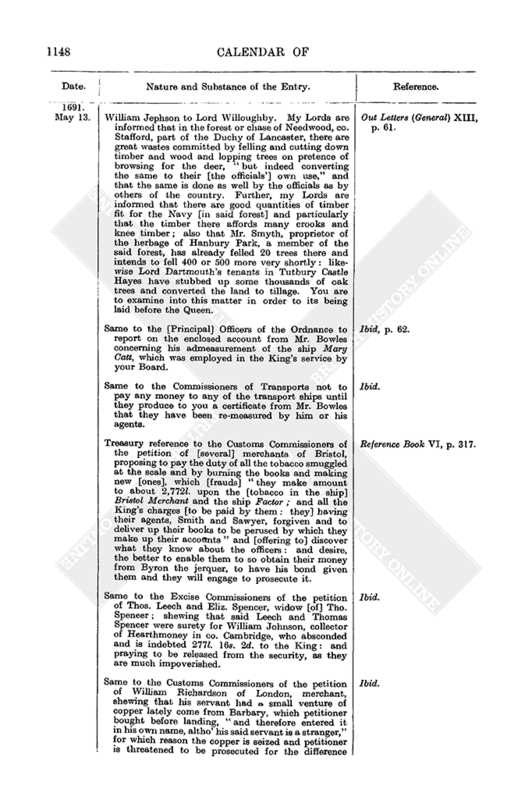 The like order on the like Order in Council for the ships Mathew and Aleppo Merchant to sail to the West Indies with the convoy going thither or the Newfoundland convoy. The Valencia Merchant, burthen 110 tons, with 12 men, to go north about Ireland from Liverpool to Leghorn with a cargo of salmon : on the petition of James Bateman et al. The Samuel and Mary, 250 tons, with 18 men, Tho. Skues master ; the Antegua Merchant, 100 tons, with 10 men ; the Speedwell, 100 tons, with 10 men, John Codner master ; the Owners' Adventure, 50 tons, with five men, Joseph Warner master ; to go to the West Indies north about Ireland before the convoy : all on the petition of John Hicks et al. merchants of Bristol. The Tyger, 250 tons, with 20 men, Richard Jeffreys master ; the Concord, 250 tons, with 20 men, Nicholas Lupp master ; the Providence, 50 tons, with five men, Hen. Branch master ; to go to Virginia [north] about Ireland before the convoy : all on the petition of John Swymmer et al., merchants of Bristol. Ibid. Treasury warrant to the Customs Commissioners to deliver a suit of tapestry hangings to the Earl of Devonshire on payment of only single duty ; the same being lately brought from Flanders : the Customs Commissioners having reported the 15th inst. that although the rate of the Customs is generally 5 per cent., that is 12d. upon the £ value, yet in divers instances it falls out far otherwise and the duty is oftentimes laid upon certain commodities in the nature of a prohibition to encourage the manufacture of the like in this kingdom, and so it happens upon stuffs made of or mixed with wool, which are rated to pay 15d. a yard, although such stuffs are not of half the value of the duty ; and in this present case they are informed that the parcel of tapestry is not worth above 40s. the ell and that the mixture of gold and silver in them is not above one-third part of the value, yet they are rated in the Book of Rates at 8d. the ell, which duty the Customs officers cannot exercise a discretion to alter or abate, but that the Treasury Lords have sometimes in particular cases for private use moderated the duty. Out Letters (Customs) XII, p. 311. 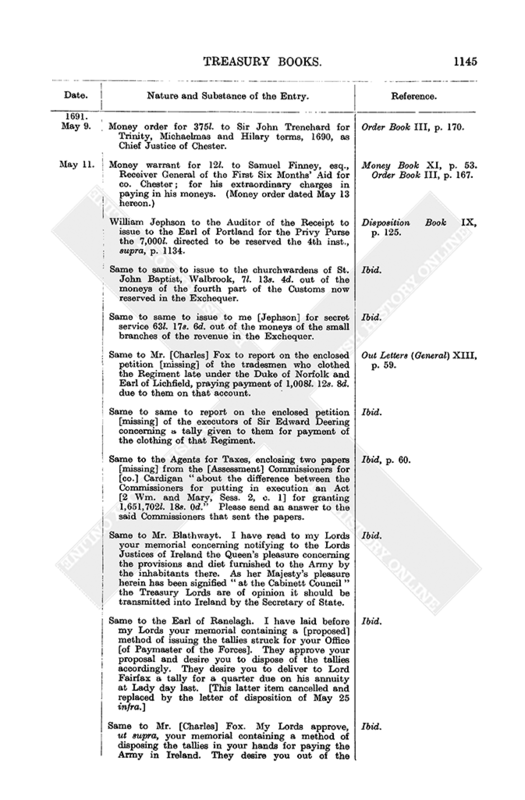 Treasury reference to Mr. Chudleigh, Comptroller of the Accounts of the Treasurer of the Chamber, of the petition of Robert Greenway, their Majesties' locksmith, praying payment of 542l. 10s. 10d. for work done in 1688 and 1689, as by bills signed by the Lord Chamberlain : there being likewise 500l. due for work done since. Reference Book VI, p. 319. 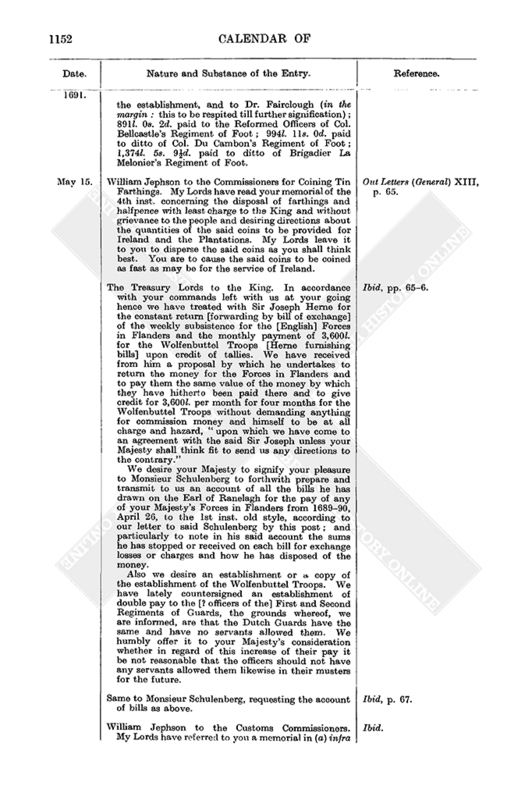 Treasury warrant to the Excise Commissioners to appoint Theophilact Blechynden to be clerk of the securities and assistant secretary of the Excise loco John Baber, who is preferred to be Solicitor of the Excise. Warrants not Relating to Money XIII, p. 420. Money warrant for 1,125l. to Thomas, Marquess of Carmarthen, Lord President of the Council, for three quarters to Lady day last on his allowance of 1,000l. per an. in lieu of diet and 500l. per an. as the King's bounty. (Money order dated June 15 hereon.) Money Book XI, p. 72. Order Book III, p. 179. Same for 35l. to Noah Starling, gent., Receiver General for co. Berks of the First Six Months' Aid, First Poll, 12d. Aid, the Review and Additional Poll and the last Poll : for his extraordinary charges in bringing up his moneys (24,690l. 18s. 4½d.) by strong guards to the Exchequer. (Money warrant dated May 23 hereon.) Money Book XI, p. 57. Order Book III, p. 170. Money warrant for 100l. to Samuell Bradshaw as Receiver General for co. Derby for the 3s. Aid [2s. Aid and Additional 12d. Aid], Additional Poll and last Poll ; for the like charges in four journeys : his receipts being 20,500l. and upwards. (Money order dated May 23 hereon.) Money Book XI, p. 58. Order Book III, p. 176. Same for 95l. to same as same for co. Derby for the First Six Months' Aid, first Poll and 12d. Aid : for like charges. (Money order dated May 23 hereon.) Money Book XI, p. 58. Order Book III, p. 176. Same for 57l. to Thomas Allen as same for co. Somerset and city of Bristol of the first Poll and Review and Additional Poll : for like charges. (Money order dated May 23 hereon.) Money Book XI, p. 58. Order Book III, p. 176. Same for 60l. 10s. 0d. to Thomas Love as same for co. Suffolk of the First 12d. Aid and Review of the Poll : for like charges. (Money order dated May 23 hereon.) Money Book XI, p. 58. Order Book III, p. 176. William Jephson to Mr. Mattocks. The Treasury Lords have written Sir Edward Seymour to pass his accounts as late Treasurer of the Navy. He informs them that you are his agent in that affair. You are forthwith to attend the passing of these accounts. Out Letters (General) XIII, p. 69. Treasury warrant to the Customs Commissioners to employ Thomas Smyth (waiter and searcher at Fowey) as tidesurveyor at Falmouth loco John Butcher, dismissed. John Plat as surveyor, waiter and searcher at Fowey. Henry Vade as searcher at Shields. Out Letters (Customs) XII, p. 311.